Lots of contract manufacturers say they have a “cleanroom”. At the other end of the scale is a true Certified Cleanroom. 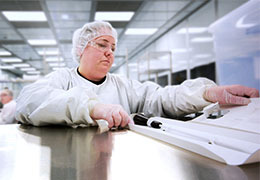 We do our manufacturing in a true Certified Cleanroom. This requires on-going environmental monitoring and maintenance in concert with outside, independent certification. Medical devices need to be commercialized using robust cleanroom manufacturing practices, so ask for a Certified Cleanroom and be sure to check the certification records for compliance.